As well as creating fantastic balloon decorations and arrangements, we can provide a local balloon delivery service throughout Bexhill on Sea. 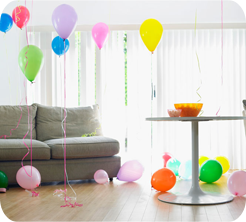 We also supply and hire helium gas canisters if you require helium for inflating large numbers of balloons. If you would like to hire a helium cylinder, please contact us for more information. For further balloon advice feel free to call us on 01424 222 711 or pop into the shop to see our full range of balloons and balloon supplies. Over the last decade, Mad Expectations has earned a reputation for being one of Bexhill's best balloon suppliers. We specialise in providing bespoke balloons and balloon decorations for all parties and special occasions. 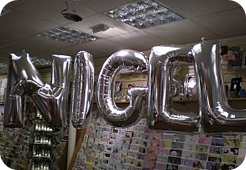 We have everything from 21st birthday balloons and novelty balloons to baby balloons and foil letter balloons. Our staff are highly experienced in creating fantastic balloon decorations for a diverse range of occasions. We also carry a large selection balloon supplies and party accessories which includes ribbons, balloon weights and coordinating party decorations.